Following its busiest year ever with more than 2.6 million passengers passing through the terminal, Hobart Airport has unveiled plans for a major terminal expansion with international processing facilities, which is being designed by Woods Bagot. Leading the airport terminal master planning and design team, Woods Bagot principal Andy Gentry explains that the initial December 2020 stage will expand the existing departures lounge and facilities, improve airline lounges, enhance passenger screening facilities, and see the construction of a swing lounge concept, capable of providing for international processing facilities. The final two stages will commence upon the completion of stage one and be progressively completed by 2030. These stages will deliver increased baggage processing facilities and further retail and food and beverage offerings. 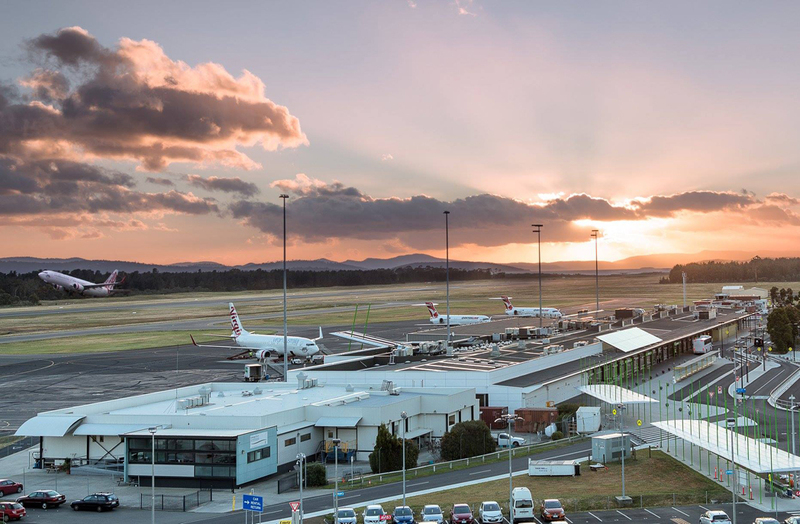 “With tourism at the heart of opportunities for Tasmania’s sustainable economic growth, the airport terminal expansion will accommodate the significant increases forecast for domestic and international passenger numbers. It will equally support the state’s robust growth in exports with non-stop services to international markets,” says Gentry. The domestic terminal will be expanded to comfortably and functionally allow for increases in passenger numbers, with an expanded airside zone for retail and food and beverage. An international processing facility will be introduced with enhanced security processing for passengers and baggage, as well as a new 550 square metre lounge for Qantas. Woods Bagot’s aviation sector leader in the Asia Pacific region, Matthew Abbott, says collaboration between airports, airlines and government agencies is improving processing efficiency, enabling a new focus on convenience and passenger experience. “We’re working on processing solutions that are fully integrated with the terminal, to create a seamless journey and more enjoyable passenger experience,” says Abbott. Woods Bagot’s lead designer, associate principal Ivan Turcinov, describes the architectural design. Hobart Airport began operations in 1956 and accounts for 58 percent of all scheduled air traffic to the state. Currently estimated at 50 percent undersized it is expected to expand by 300 percent by 2030.